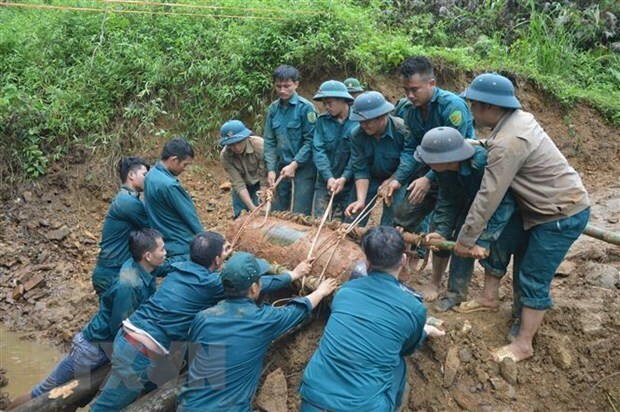 Quang Tri (VNA) – As many as 85 shells left from the war were safely detonated in the central province of Quang Tri, said the Mines Advisory Group (MAG) on March 28. MAG members found an underground pit containing the shells when they were clearing unexploded ordnances (UXOs) in Lien Chieu village in the province’s Trieu Phong district. The shells were of different types, including mortar shells, grenades and detonators. The MAG is registered as a charitable company in the UK. It is a humanitarian and advocacy organisation that finds, removes and destroys landmines, cluster munitions and unexploded bombs from places affected by conflict. According to the Ministry of Labour, Invalids and Social Affairs, Vietnam is one of countries most contaminated with UXOs. It is estimated that about 800,000 tonnes of UXOs were left across the country after the war ended in 1975, mostly in the central region. Some 6.13 million hectares of land are polluted with or suspected of being polluted with UXOs, accounting for 18.82 percent of the country’s total area.